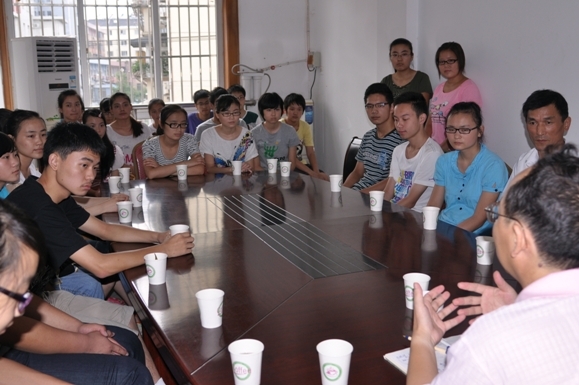 This year, 23 poor high school students were admitted to regular universities, including Miss Sun Ting who was accepted by one of the most prestigious universities---Beijing Normal Universities. Six more were admitted to 3 year colleges. Some of the students have been supported by us since our start on 2004. Ting Sun will go to Beijing Normal University in a few days---one of the best universities in China. 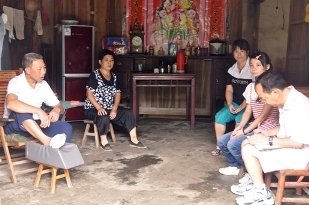 She will study Chinese and becomes a teacher which gives her free tuition for four years. Her father(in photo) was diagonized as end stage stomach canser three years ago. Amazingly, he is still alive but depends on expensive medicine to keep it going. Due to financial problem, he only took the medicine on and off. She has been sponsored by a local company during her high school year through us. Li Chen will go to Anhui Commerce and Trade College, a three year college. Her father died of cancer 8 years ago with debt. She lives with her loving mom and grandparents. Her mom made and sold breakfast to support her study when she was in middle and high school (they rent a small room near school), a little far from home. Her grandma injured one of her feet years ago while cutting woods. Her grandpa has also recently injured his foot with surgery costing them more than 10000 yuan. She has been supported by us since her middle school years. She will be supported by a nice lady through us. ShuangYue Xu, just graduated, decided to give up her 3 year college admission to do odd jobs to support her family. Mr. Hu and I tried very hard but failed to convince her to go to college. She told me that she would have definitely been out of school during her middle school year (6-8th grade). She worked full time (more than 10 hours a day) during summers of her high school (and now) at a supermarket and also worked during weekends to help her family of three. Her mom is extremely weak and can not work. Her father is weak and often sick too. She is very protective of her family. We have supported her since 2004 (when she was a 4th grader and the first time I met her). Although the above photos are only one year apart, they tell a very different story. She was happy last year and full of hope (to get into are regular university), and is sad this year that she will not be in school anymore. Too much pressure and too much burden on a young girl of her age. It has changed since my writing. Mr. Hu called her again to see whether she had changed her mind. She did not but recommended us to support her classmate Qin Zhong, also in very bad situation (her parents died of one car accident years ago and her grandpa died a few years later. She lives with her aged grandma for last few years. Someone sponsored her in the elementary school through us but did not do it anymore in middle school. We intended to continue to support her but she told us that a local company agreed to support her. Unfortunately, the local company stopped to support her during her high school years and she never told us or her teachers). Mr. Hu called Qin and found the detail and decided to support her for her college. Mr. Hu also asked Qin to talk with Shuangyue about her choice. The two classmates and friends talked. It was to our surprise that both showed up yesterday and Shuangyue decided to continue her college study. Classmates know better how to talk than us, I have to admit. Anyway, a very happy ending.